As a nation, we’re almost obsessed with our looks. We’re always trying to improve our appearance, and many of us are dishing out some serious cash to do it. Here’s proof: According to the American Society of Plastic Surgeons (ASPS), Americans spent $16 billion on surgical and minimally invasive cosmetic plastic surgery procedures in 2016. Other often-requested surgical procedures in 2016 were liposuction, with more than 235,000 surgeries performed; rhinoplasties, or “nose jobs,” with 223,000 procedures; and tummy tucks, with almost 128,000 procedures. Liposuction removes excess fat deposits in target areas of the body, improving body contours and proportions. It also slims and reshapes the targeted areas. Rhinoplasty reshapes the nose. This surgery can make the nose larger or smaller, or it can adjust its angle in relation to the upper lip. During rhinoplasty, the surgeon can alter the tip of the nose, and correct defects such as bumps and indentations. A tummy tuck, also called an abdominoplasty, is often used on people whose tummies bulge or are loose and sagging. During this surgery, the doctor can remove excess fat and skin from the tummy area. In many cases, the surgeon is also able to restore weakened or separated muscles, creating an abdomen that is flatter and firmer. 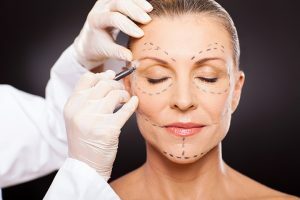 Additional surgeries that made the most popular list for last year include eyelid surgeries, or blepharoplasties, which lift drooping eyelids, and facelifts, which improve the appearance of sagging, wrinkled skin on the face and neck. There were more than 209,000 eyelid procedures and more than 131,000 facelifts performed in 2016. In the minimally invasive arena, injections to treat wrinkles, such as those done with BOTOX® Cosmetic, top the popularity list, with 7 million procedures performed last year. Treatments like BOTOX Cosmetic block the nerve signals to the muscles so they can’t contract. This relaxes the wrinkles and makes the face smooth. Most often, they are used on crow’s feet, frown lines and deep furrows on the forehead. Soft tissue fillers, such as those made with hyaluronic acid, a naturally occurring substance, are second on the list of minimally invasive favorites. These fillers are injected into the face and lips to diminish lines and restore volume and fullness, resulting in a more youthful appearance. Last year, 2.6 million of these procedures were requested. Other minimally invasive procedures that were popular in 2016 include chemical peels, with 1.36 million procedures performed; microdermabrasions, with 775,000 procedures; and laser treatments, with more than 650,000 treatments completed. Laser hair removal was also popular last year, requested in 1.1 million cases. These are not the only cosmetic procedures, surgical and nonsurgical, available to enhance your overall appearance. Among the others are arm, thigh, brow, neck or even whole body lifts; ear and chin surgeries; and surgery to reduce breast tissue in males. Vaginal and buttocks enhancements are also growing more popular in this country. For another minimally invasive approach, there’s permanent makeup.